Johannesburg - Olympic gold medallist Wayde van Niekerk stands a good chance of winning his third sport star of the year award during the SA Sport Awards event at Emperors Palace ­on Sunday evening. He has won the award for the past two years. He performed brilliantly again this year, winning an International Association of Athletics Federations (IAAF) gold medal. However, he faces stiff competition from his fellow athletes, long jump world champion ­Luvo Manyonga and 800m gold medallist Caster Semenya. Van Niekerk’s 2017 campaign included two medals at the World Championships in ­London in August and a 300m world best of 30.81 seconds in Ostrava in June. 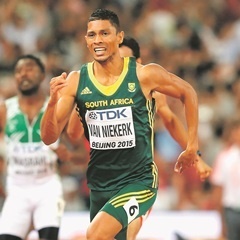 Van Niekerk toppled Semenya and Proteas cricketer Kagiso Rabada last year to win the award, after his world record-breaking run at the Rio Olympics in Brazil, in which he ­blasted off the final corner to clock 43.03 ­seconds – 0.15 seconds faster than American Michael Johnson’s previous world record set in Seville in 1999. In 2015, Van Niekerk also scooped the award after beating world champion mountain bike racer Greg Minnaar and 2012 ­Olympic champion Chad le Clos. Van Niekerk will also go toe-to-toe with footballer Percy Tau and boxer Zolani Tete on Sunday night. Bafana Bafana and Mamelodi Sundowns ­forward Tau was instrumental in helping ­Sundowns clinch the CAF Champions League. Tau’s incredible rise has seen him win the continental Super Cup with the Brazilians, and he has recently proven to be a key ­player for Bafana in the 2018 World Cup ­qualifiers – he scored during the 3-1 victory over Burkina ­Faso to help keep the team’s hopes alive. The 29-year-old Tete has made history by becoming the first boxer to get a nomination for the top award. The pugilist beat Filipino Arthur Villanueva to win the World Boxing ­Organisation bantamweight title in April. Semenya is the only woman who has been nominated for the award. She won a gold medal in the women’s 800m and a bronze medal in the 1 500m at the IAAF World Championships in London, where Manyonga won gold in the men’s long jump. This week, Van Niekerk was included among the finalists for the IAAF World ­Athlete of the Year Awards. Last year, he was also among the IAAF ­finalists after winning the Olympic 400m title and breaking the world record, but lost out to ­Jamaican legend Usain Bolt, who earned his third Olympic treble. This year, Van Niekerk is up against British distance runner Mo Farah – who secured gold in the 10km and silver for the 5km at the World Championships – and world high jump champion Mutaz Essa Barshim of Qatar. The winner will be revealed at the annual IAAF awards ceremony in Monaco on ­November 24.